With the emergence of new smart home products, people’s lifestyles are quietly changing. Among them, smart sweeping robots are undoubtedly one of the most intelligent hardware for consumers. They have gradually entered more and more families. Recently, we have got two popular sweeping robot products, which have also gained a good reputation in the industry. We are going to compare the Xiaomi Roborock Sweep One Black Edition with the 360 S6. From the appearance point of view, the current shape of the sweeping robots on the market may be similar. So users should not only pay attention to it but also care about the design details that have an important impact on the actual use. In order to distinguish the two products more, we chose the black version of the Roborock cleaner. As you know, initially it was launched in white. The size of the two sweeping robots is very close, and the round shape is also very suitable for the home environment. At the top of the two sweeping robots, they are equipped with LDS laser radar, which can plan the cleaning route more accurately. At the same time, the opening key and the backfill buttons are at the top of the fuselage. On the Roborock Sweep One, there is also a partial sweep button that allows one-click cleaning of specific areas. After opening the cover of the top of the two sweeping robots, we can see the dust box inside and the brush for cleaning the dust box. The dust box of the 360 S6 is made of transparent plastic material. It is convenient to take out the garbage inside. The dust box is also equipped with a strainer to prevent the dust from spreading during the cleaning process. At the same time, the filter box of the dust box also supports washing, further reducing the to-be costs. In terms of the design of the dust box, there is not much difference between the two, and the capacity is relatively close. They are also equipped with dust-proof filters, supporting water washing. Users do not have to worry about secondary pollution of dust when cleaning. From this point of view, these two sweeping robots are very worthy of recognition. In the design of the dust collecting port, the two sweeping robots still maintain a high degree of similarity. And in order to solve the noise problem of the sweeping robot during the cleaning process, the 360 S6 adopts a double silencing channel design to ensure the sweeping of the ground. Though the robot has super suction, it also reduces the noise to a lower level. On the body of the 360 S6 and the Roborock Sweep One, we can see the LSD lidar ranging sensor, which can quickly and accurately establish a panoramic map of the interior, and then more accurately plan the cleaning route of the sweeping robot. Let’s take a look at the bottom design of the two sweeping robots to see how they can better clean the ground rubbish. From the overall design point of view, the two also look very similar. Both come with a combination of single-sided brush and roller brush, while at the bottom there are rollers and universal wheels, to ensure better maneuverability of the sweeping robot. In addition, the two sweeping robots adopt the current mainstream single-sided brush design. Compared with the traditional double-sided brush design, the single-sided brush has two major advantages. First, during the cleaning process, the one side brush can effectively avoid the flying of the garbage, and the design of the single-side brush also enables the sweeping robot to better adapt to the complex family environment, such as having a stronger ability to get rid of the carpet when encountering carpets, wires, and thresholds. The 360 S6 adopts the floating main brush design, which has a stronger adaptability to the clean environment. Whether it is the tile floor or the carpet environment, it will work perfectly. In the charging mode, the two sweeping robots support automatic recharging, and the design of the charger has certain differences. Among them, the 360 S6 adopts the contact charging pile design, and the sweeping robot can be easily connected to the charging pile for charging. The Roborock Sweep One still uses the more traditional L-shaped charging base design. It takes more time to connect the sweeping robot, but it is more stable after the connection. In order to adapt to the cleaning environment in the home, the thickness of the two sweeping robots is relatively thin, which can be easily accessed into the sofa, the bottom of the bed, and under the table. With the help of the LDS ranging sensor, the height of the obstacle can be judged autonomously, and it will not be chaotic in the area that cannot enter. As a representative of smart home products, both sweeping robots support app remote control. Users can control the sweeping robots through the smartphone. The Xiaomi Roborock Sweep One supports the setting of area cleaning, scheduled cleaning, intelligent carpet pressurization, etc. The 360 S6 not only supports the cleaning of the zone but also can customize the partition name, and then control the robot to clean the relevant area through the Tmall Wizard, giving the sweeping robot more intelligence. The 360 S6 also supports the breakpoint sweep, and multiple maps can be saved. For example, in some duplex homes, the upstairs and downstairs areas can be saved on the sweeper, allowing the sweeping robot to complete the sweep more efficiently. As a very important ‘skill’ for sweeping robots, path planning has always been an important basis for measuring the performance of sweeping robots. Moreover, the precise path planning enables more efficient floor cleaning. The two sweeping robots use LDS laser ranging sensors. How do they differ in the planning of the cleaning path? To this end, we chose the living room with an area of 16m2 to test, and set some obstacles in it, such as round tables, sofas, stools, etc. We can see that the two sweeping robots are reasonable in planning the path, which can reflect the powerful performance of the LDS laser ranging sensor. However, in some details, we can also see the difference between the two. Say, when the 360 S6 in the cleaning corner area, the route planning is more effective. There are only a few repeated or chaotic paths, and the final cleaning time is also shorter than that on the Roborock Sweep One. According to official data, the two sweeping robots have the highest 2000PA suction, which is basically the top for the current sweeping robots. In order to better reflect the cleaning ability of the two sweeping robots, we also conducted field tests. First, we conducted a suction test. In order to better test the suction of the two sweeping robots, we also used the seeds to simulate the garbage on the ground. The test environment was a wooden floor. Let’s take a look at the actual performance of the two. The first product tested was the 360 S6. We set the sweeper to the powerful mode, and then cleaned it with the remote control through the mobile app. The result proved that its super suction is enough to clean the large particles on the ground, and the cleaning efficiency can reach more than 99%. We also set the Roborock Sweep One to the strongest mode, and then controlled the sweeping robot through the mobile app to clean it. The result was also satisfactory, and there was no obvious garbage residue. The cleaning efficiency was comparable to that of the 360 S6. Below, we also tested the tea debris by simulating garbage debris. As a result, the two sweeping robots completed the cleaning task very efficiently, and there was no situation in which the garbage was thrown or left. For the sweeping robot, it is inevitable that there will be situations where it is necessary to overcome obstacles during the cleaning process. So the sweeping robot also needs to have a good ability to overcome obstacles. According to official data, these two sweeping robots can span 2cm obstacles. Below we have chosen a more common scenario to test. That is, can the sweeping robot cross the edge of the carpet? Through the actual tests, the 360 S6 is stronger than the Roborock Sweep One in terms of overcoming obstacles. The former one can easily cross the edge of the carpet without affecting the planning of the cleaning path, while the Roborock Weep One couldn’t cross when encountering the carpet. In the process of using the sweeping robot, users often suffer from noise. So they schedule the cleaning when they are not home. For this reason, we also carried out the actual test. After turning on the strongest cleaning mode of both sweeping robots, we placed the noise tester at 60cm above the sweeping robot. At this time, the noise of the 360 S6 reached 58.5 decibels, while the Roborock Sweep one had a noise of 68.3dB, which is significantly higher than the former. In order to give the user a quiet cleaning environment, the 360 S6 also supports the quiet mode. Through the comparison of these two products, it can be seen that the 360 S6 and the Roborock Sweep One are evenly matched in the cleaning ability. Due to the LDS laser sensors, the two sweeping robots are also significantly more intelligent in the path planning. Basically, there will be no ‘chaos’, and the cleaning route can be planned reasonably. Thus, the cleaning efficiency is significantly improved. 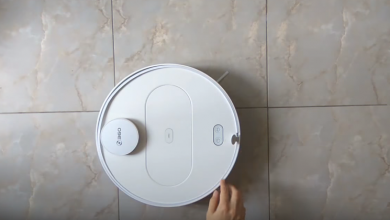 However, we found out that the 360 S6 is more precise in the planning of the path, especially for the corners, and the cleaning time is also shorter than the Roborock Sweep One. In addition, the 360 S6 is also very worthy of recognition in obstacle avoidance and noise control. It is not only more adaptable to the environment but also does not affect the normal family life of the user. Finally, the 360 S6 was officially priced at 1499 yuan ($216). So the price advantage is very obvious, as the Roborock Sweep One is priced at 2599 yuan ($374). But we should also note that the Xiaomi product supports the ‘sweeping and dragging’ option. Thus, after the cleaning, it can mop, providing a more comprehensive cleaning of the home floor. So consumers should choose one of these, according to their requirements and needs.